Wasserman Schultz On Senate Budget: American People Not Interested In "Focusing On Process"
DNC Chairwoman Rep. Debbie Wasserman Schultz (D-FL) and FNC's Bret Baier spar on the Democratic-controlled Senate's inability to present and pass a budget of their own. Wasserman Schultz, as she has said before, says to ask Senate Majority Leader Harry Reid (D-NV) because he is the one who is in charge of what goes to a vote and what does not. 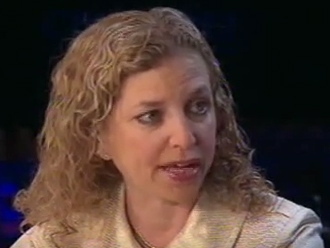 Wasserman Schultz, however, said people aren't interested in the "process." According to the DNC chair, the American people are interested in stopping the Paul Ryan budget, which "ends Medicare as we know it." "Focusing on process is not what the American people are interested in. What they're interested is making sure the Romney-Ryan budget, that ends Medicare as we know it, that would allow student loan interest rates to double [doesn't pass]," she said on FOX News' coverage of primary election results on Tuesday night. "Please ask him about it," Wasserman Schultz said about Reid. "And I'll continue to make sure to speak for the Democrats." Washington Post's Cillizza: "Mitt Romney Isn't Cool, Barack Obama Is"